Spot prices are set to increase in price over the next week but the rise is thought to be smaller than expected as although the temperatures will turn colder, the drop will not be as bad as first thought. Forecasts of reduced wind production in Germany may also have been slightly off which could be the reason why German week-ahead prices fell yesterday. How did the energy markets close? Day-Ahead gas failed to make any movement and closed at a price of 65.85ppt with the colder weather and a reduction in Norwegian imports having no effect. The rest on the Near-Curve made losses with Front-Month decreasing by 0.35ppt to close at 65.55ppt. On the Far-Curve 2013 and 2014 contracts reduced in price but 2015 contracts saw almost no change. The Power curve saw Day-Ahead remain unchanged with May-13 and June-13 contracts making intra-day losses, falling carbon allowance prices contributing to these discounts. The Far-Curve saw every contract except Winter-15 make a loss, Winter-14 seeing the biggest drop of £0.25/MWh. How did the energy markets open? Day-Ahead gas made a gain of 0.4ppt thanks to colder weather and a decrease in Langeled pipeline flows. The Far-Curve also went up as a result of higher oil demand in the United States and EU economic changes. The Power curve didn't follow the Gas curve's direction this morning with Day-Ahead dropping by £0.75/MWh to open at £48.50/MWh. 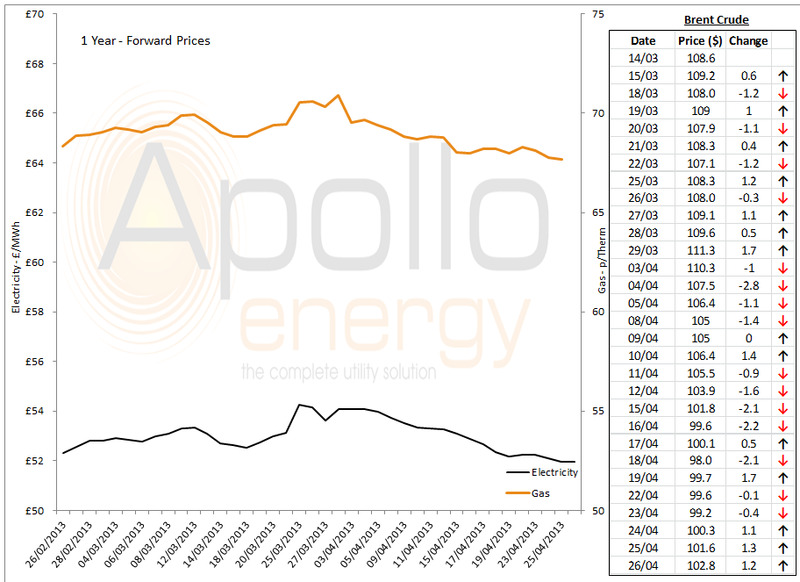 On the Far-Curve Winter-13 fell to its lowest price since February with reduced carbon allowances and falling APi2 month coal prices having an impact. Two nuclear reactors are set to come back online after the weekend and wind availability should also increase. Market close data has revealed that the 1-year forward price for commercial gas saw a drop of 0.1ppt & commercial electricity kept its price - closing at 67.68ppt and £51.98/MWh, respectively. This can be seen in the graph below. Note: Brent Crude prices are taken from opening market data, and do not represent the price as it changes throughout the day. Brent Prices hit 103.49$/b on the 20-day moving average before settling at 102.8$/b and the Brent/WTI spread rose to 9.55$/b. The UK Q1 GDP growth and an improvement on the US unemployment front have given support to the risk appetite which has been increasing as of late.